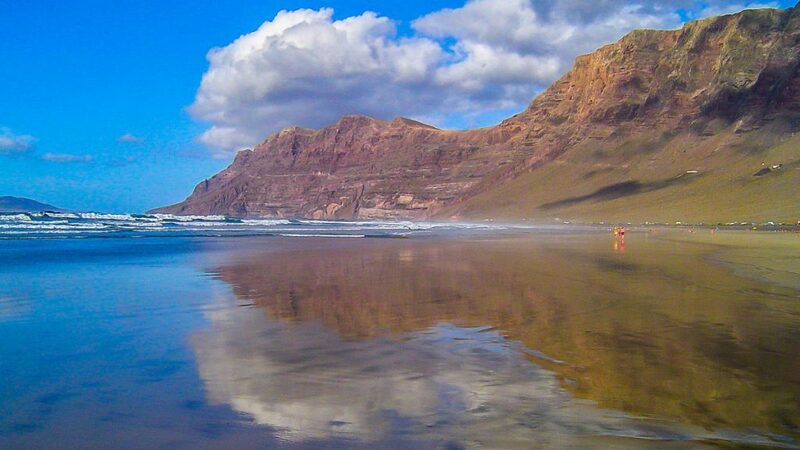 Famara Beach is located in the municipality of Teguise, in northwest Lanzarote. Five kilometres of golden sands that start in the fishing village of La Caleta de Famara and extend as far as the bas of the magnificent cliffs. Its full beauty is revealed at low tide, when the water recedes to form a shallow layer over the sand, reflecting the sky and cliffs like a giant mirror. And if the tide coincides with the sunset, visitors can take advantage of a unique photo opportunity and immortalise one of the Canary Islands’ best-known views. The constant breeze and swell also make this beach popular for those eager to learn and enjoy a range of water sports including surfing, windsurfing, bodyboarding and kitesurfing. It is also the ideal spot for practising air sports such as paragliding and hang gliding, with the top of Famara cliffs providing a perfect take-off point. At low tide, the ocean retreats, leaving vast rockpools dotted along the shore. The calm and shallow water make this the ideal setting for relaxing in the sunshine and enjoying leisurely strolls by the sea. Playas de Papagayo are a firm favourite amongst visitors and locals alike. Two kilometres of fine golden sands bathed by crystalline waters divided into a succession of coves: Mujeres, El Pozo, Caleta del Congrio, Puerto Muelas and El Papagayo, the most famous of all. Visitors will be entranced by the bay-shaped Papagayo beach with its calm, crystal-clear emerald waters that are ideal for bathing. It is located just a short distance from the tourist resort of Playa Blanca, in the south of the island. A charge is made for vehicles wishing to access this area, which has a car park and campsite situated nearby. Los Charcones, nestling in southern Lanzarote, is made up of unspoilt natural pools, creating a stunning natural setting boasting breathtaking views. It is the ideal spot for unwinding over a good book, enjoying pleasant company or simply luxuriating in the most reassuring solitude. The pools stretch out for almost two kilometres and are perfect for relaxed and unhurried bathing. There is also a launch area, located at Pechiguera Lighthouse on Playa Blanca. The succession of pools forms a spectacular landscape shaped by nature. The varying depths and plays of light create myriad tones of turquoise and shades of blue that colour each of the pools. The route leading to Los Charcones is quite uneven, although is suitable for even small cars. A spot definitely not to be missed by those eager to explore the most authentic, unspoilt Lanzarote. Situated in Puerto del Carmen, the island’s first tourist area and today one of the most popular and liveliest locations. This is the ideal choice for families, thanks to the calm waters and wide range of services and facilities including toilets, showers and changing rooms, as well as vending machines selling drinks and snacks. Visitors can also hire sun beds, sun umbrellas and small boats, as well as equipment for scuba diving and other water sports. The beach is also the site of one of the Red Cross’s main bases and the beach has a lifeguard service. Playa Grande is not just a beach for the islanders; it is also one of Puerto del Carmen’s major landmarks and the setting for the biggest event of the year: Ironman Lanzarote. It also provides the backdrop for New Year’s Eve celebrations which include a band playing on the avenue behind the beach and fabulous firework displays. The avenue backing the beach is known as Avenida de las Playas and is lined with the island’s biggest range of apartments, restaurants, discos, bars, supermarkets and stores. 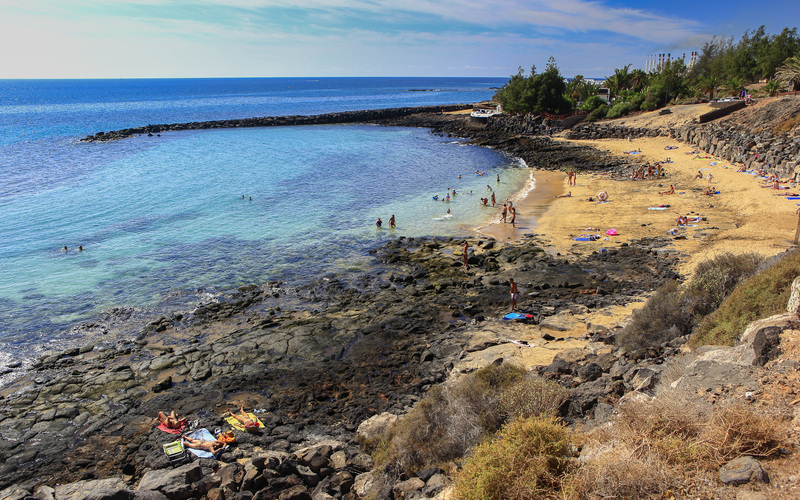 Playa del Rey, also known as Playa de El Ancla, is situated on Costa Teguise, a delightful cove that is a mere forty metres in length yet boasts an unbeatable location sheltered from the breeze for which Lanzarote is renowned. It is the best spot for bathing in the tourist resort of Costa Teguise. It is perfect for little ones eager to have fun and go swimming due to the calm waters which are protected from the sea currents by natural stone barriers lining the horizon. The sea bed is quite simply mesmerising, with myriad colours ranging from the deepest blue to brilliant turquoise, forming a fabulous contrast with the brilliant white and toasted volcanic sand that is characteristic of this picturesque area of Lanzarote. Stretching out over 1.2 km and bathed by turquoise waters, this is the longest beach and is ideal for families with children. This year it has once again been awarded an EU Blue Flag in recognition of the quality of its water, the environmental management systems, safety and services, as well as the standard of the information and education provided. Nestling in the centre of the historic town, renowned for its seafaring air, the beach is just a short distance from the harbour. 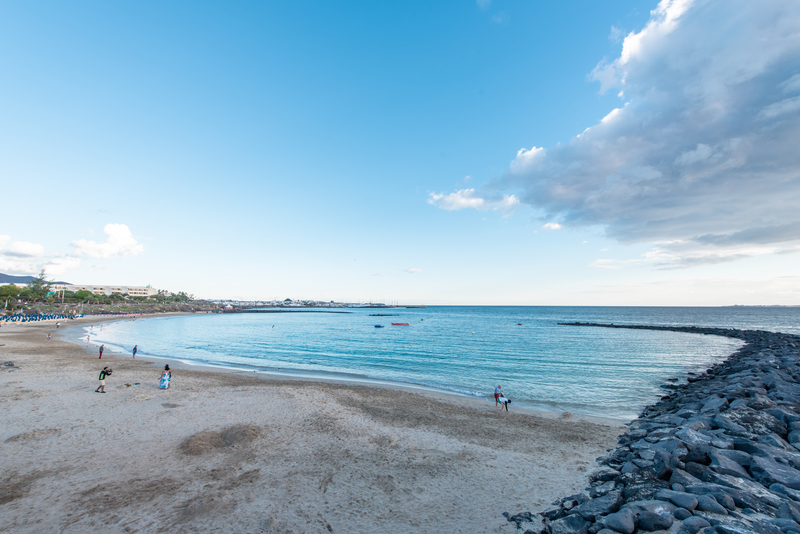 The extensive choice of eateries and its proximity to a large number of hotels have made Playa Blanca one of Lanzarote’s best-loved destinations, offering easy access to the rest of the island by road or public transport.